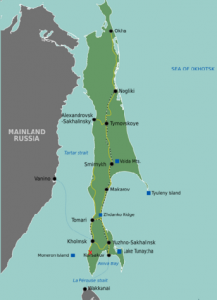 MOSCOW, Russia, December 1, 2015 (ENS) – A Russian-flagged oil tanker has run aground off Nevelsk on the southwest coast of Sakhalin Island, spilling oil into the sea, Russia’s Ministry of Emergency Situations reports. 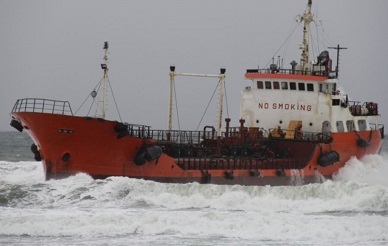 The 124-meter-long tanker Nadezhda loaded with 786 tons of fuel oil and diesel fuel was caught in a severe storm and blown onto a rocky shore in the Tatar Strait Saturday. The Nadezhda’s hull and cargo tanks were damaged, and water flooded the engine room. The ship grounded close to a fishing port and the spilled oil has polluted several kilometers of shoreline. The vessel was en route from Nevelsk to the Sakhalin Port of Vanino when the incident occurred. Russian emergency officials state the crew of eight are safe, and authorities have dispatched a tug and a salvage vessel as well as more than 80 cleanup workers. The exact amount of oil that was spilled was not given by authorities, but they said the oil remaining on board was moved to the ship’s undamaged tanks to prevent further spillage. Responders are reported to have disposed of some 105 cubic meters of contaminated sand. Completed cleanup is expected to take at least two weeks. The remaining oil will be pumped out and the hull will be repaired before it is floated again, emergency officials said. Sakhalin is a large Russian island in the North Pacific Ocean lying just off the east coast of Russia and just north of Japan. The oil spilled by the Nadezhda is not expected to reach Japan.